Phuket dive sites are best explored with Merlin Divers Phuket ! 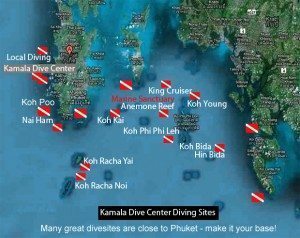 Full day dive trips and dive tours to the the best Phuket dive sites and spots around Phuket with Merlin Divers Dive Centre and Scuba School leave from Chalong Pier. The divers get picked up in Kamala by a mini-bus around 7:00 – 7:30 am for a transfer to Chalong Pier. On the boat the divers will have a chance to eat breakfast and set up the diving equipment and then relax for the dive trip out to the Phuket dive sites. 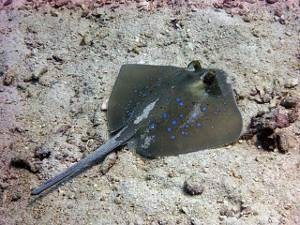 On these Phuket dive sites trips and dive tours the divers can make 2 or 3 dives depending on which dive trip the divers have booked. All dives will be guided by professional dive guides. Lunch is included as well on all the day trip diving & dive tours – there is also plenty of drinking water, coffee, tea and lots of fruit. From a dive excursion the divers return at about 4:30 pm with 2 dives – with 3 dives at about 6 – 7 pm in the evening. Merlin Divers dive shop recommends that divers get in touch with the dive center first so that they get advised on the best dive program, depending on the seasonal conditions, time schedule, itinerary and personal goals. Thailand diving is best done from Phuket – in Merlin Divers opinion – from local half-day diving in Kamala, day trips around Phuket to a liveaboard in the Similan Islands – Thailand. There are basically 3 directions to go Phuket Dive Sites & Scuba Diving – a short description follows below. All 3 dive sites lie within a Marine Sanctuary – about 1½ hours east of Phuket . For more than 20 years for 2 km around the dive sites anchoring and fishing has been forbidden. Hence the divers can find lots of marine life and the best variety of corals and sea life. Visit Shark Point Phuket & Anemone Reef & King Cruiser Wreck for a schedule and prices. Shark Point Phuket is one of the most popular of Phuket dive sites and dive trips on Phuket. A giant rock formation that boasts sharks, lots of tropical fish and colourful soft corals and sea fans. The reef comes in three sections and there is enough diving here to span several days. Divers can often encounter Leopard Sharks here on the sandy seafloor, hence the name. The Thai name for the dive site is Hin Musang or ‘Shark Rock’. From the sea ‘Shark Point’ looks like a small rock formation. It is under the water that it’s magnificence is revealed to the diver. Anemone Reef Phuket is a completely submerged dive spot – small but very rich with all sorts of marine life. The reef – which has the form of a bread loaf – about 30 meters long and 6-8 meters wide is covered all over with Anemones – hence the name Anemone Reef. Especially good for underwater macro photography, this is the best place to find around Phuket – lots of different moray eels, ghost pipe fishes, sea horses, clown fishes to just mention a few of the vast number of fishes there. The King Cruiser Wreck is a huge 85 meter long passenger ferry sank on the 4th of May 1997 in the midst of the Marine Sanctuary by first hitting the Anemone Reef and finally bottoming out at 30 meters. It quickly became of the most popular Phuket dive sites to dive because it was the first real wreck available in the area. Meanwhile it became the home of lots of groups of fishes – from travellies, mackerels and barracudas – to fusiliers, snappers and even giant barracudas. This wreck dive is suitable for all level of divers – mainly because Merlin Divers Diving Center and Scuba Dive School can adapt the depth for the divers according to their experience and because entering the wreck is nowadays considered too dangerous – and is therefore not done any more – because the wreck has started to collapse. The Racha islands – Racha Yai about 1½ hour south of Phuket and Racha Noi about 2 hours south of Phuket – are 2 of best known dive sites around Phuket. These 2 islands offer some of the best visibility of any dive spots around Phuket because they lie facing the open sea. Visit Racha Yai & Racha Noi for a schedule and prices. Racha Yai meaning the “Big King” offers dive sites all around the island. The diving is done all year round – but during the months of May to September the diving is mostly conducted on the protected east coast of the island. Most dive sites offer to start in a bay – relatively shallow water with sandy bottom – perfect for beginners. Even in the shallow water divers have lots of staghorn corals and coral bommies. The bays are numbered 1 through to 5 and the reefs have names such as Home Run, Staghorn Reef and Lucy’s Reef. The reefs are home to a large variety of marine life with many fish, Moray Eels, Giant Barracuda and Turtles being regularly found. Many reef fish such as Parrot fish, Snapper, Grouper, Angelfish and Butterfly fish are common. 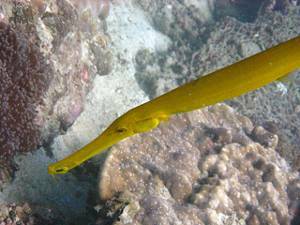 Rarer fish such as Leaf fish, Ghost Pipe fish and Leopard Sharks may be spotted occasionally. Usually mild currents and mostly divers just drift dive along one of the reefs. For certified divers there a few wrecks around in water of 20 – 30 meters of depth. The wrecks are Marlas at 30m, a Sailboat at 24m and what is known as The Speedboat at 21m on the southern end of Home Run reef. Racha Noi meaning the “Small King” is 30 minutes further south of Racha Yai. The dive spots are also all around the island and similar to her sister island to the north. For the dive sites around the island the same can be said as for Racha Yai – suitable for all levels of divers. What makes Racha Noi special however are the 2 pinnacles – one to the north end and the other one to the south end of the island. These are a bit more challenging and therefore a bit more experience is required from divers to dive there. Especially the southern point is spectacular and is one the dive sites around Phuket where divers diving with Merlin Divers Dive Shop have the chance to see a Manta ray or Whale shark. The Phi Phi Islands national park is 3 hours due east of Phuket – world-wide famous because of the film “The “Beach” and of course because of its beauty – the spectacular limestone cliffs, with forests on top surrounded by blue water. Visit Phi Phi Islands & Bida Islands Phuket for a schedule and prices. Bida Nok and Bida Nai are just 10 miles south of Phi Phi Leh island and are really the dive sites of Phi Phi islands. Both islands are uninhabited and very small. But under the water they are fantastic. The limestone cliffs become under the water drop-offs and are coral encrusted from top to bottom with a rich and colourful diversity of marine life. Easy dive sites – again suitable for all divers. Phi Phi Leh offers some excellent diving too. Also this island is uninhabited and the nature is unspoiled. The same can be said for the under water world.Since the limestone cliffs are much longer then the one are the Bida islands these spots are perfect for drift dives. Merlin Divers is looking forward to see you diving around our Phuket dive sites – contact us now!